I graduated from Matthew Halton High School in Pincher Creek, Alberta. Currently, I am in my third year of a Bachelor of Science degree at Brandon University with a double major in Mathematics and History. I plan to finish my degree next year and apply to BU’s Education after-degree program. I was born in Pincher Creek, Alberta and lived nearby at Brocket Colony for most of my childhood. I am the oldest in my family and have three younger brothers. In 1996, my family moved to another Hutterite community near Odessa, Washington, where we lived for three years before returning to Brocket. In 2010, my family moved to Netley Colony, near Petersfield, Manitoba. I’ve been blessed to grow up as a Hutterite, where the melding of faith, family, and community have had a significant influence on who I am today. I am grateful for the many opportunities I have received and the various projects I’ve been able to pursue, all with full support from my family and community. Shortly after moving to our current home in Netley, I produced a set of songbooks for congregational singing, an integral feature of Hutterite community worship praxis. Most recently, I launched a new business called B Inspired Gifts & Books where I design, produce and sell Hutterite-made inspirational home décor, books, and CDs. I am also thankful to have benefited from numerous educational opportunities. The small size of our community in Alberta required us to attend public school in the nearby town of Pincher Creek and I am very grateful for the amazing teachers who still influence my decisions as an adult. As part of my high school education, I received the Alexander Rutherford Scholarship for academic achievement throughout high school and was also the recipient of the Connelly Award for the highest grade 12 English mark. Finally, I am grateful for the opportunity to attend university, which I hadn’t considered until I was presented with the opportunity by my community a few years ago. With a lot of hard work, and despite having graduated from high school over ten years earlier, I’ve been placed on the Dean’s Honor List and inducted into the President’s Honor Society for the past two years. This past year, I’ve been privileged to work as a lab assistant, marker, and tutor for the math department at Brandon University and also serve as a research assistant for Dr. Patricia Harms. I enjoy this work because it gives me an opportunity to expand my knowledge and gain broad experience in preparation for my future as an educator. I’ve always enjoyed school, and the opportunity to further my education came about when my community encountered a need for more teachers. It was a natural decision on my part; I have been “teaching” since I was a young child and have fond memories of finding the most interesting places to “play school” with the other children in our community. When my family moved back to Alberta in 1999, I began Deutscheschule (German School) with my younger brothers and cousins. Granted, I was still a young student myself at the time and the work consisted mainly of workbooks, but my love of teaching flourished and I eventually taught German in a more official capacity. A few years after my high school graduation, my parents chose to leave the public education system and for the next four years I was also given the responsibility of overseeing my younger brother’s education in a homeschool setting. My interest in math and history was borne out of my own experience in high school and university. I’ve always enjoyed math and it was a natural decision to choose it for my first major. History came as a surprise because I’ve never enjoyed writing; however, I enjoy the study of history and believe we all have something to learn from the past. I recently happened upon a quotation by Ricky Maye: “Conversation isn’t about proving a point; true conversation is about going on a journey with the people you are speaking with.” I’ve always loved good conversations – the kind that raises good questions, where people can respectfully share ideas, and where disagreement is acceptable. Asking questions is a great way to start conversations and I much prefer people asking me questions than making assumptions. Ravi Zacharias says that “behind every question is a questioner – and one must always seek to respond to the individual and not merely the question.” I believe it is vital to recognize that each person’s perspective is the collective result of their experiences and environment. Without this realization, how can we hope to gain understanding and learn from each other? After completing my education after-degree, I expect to teach at Netley School. I hope to instill in my students a passion for learning that goes beyond their school environment and a determination to continue building healthy communities for the future. I would like to nominate Beverly Katherine Walter for this recognition. She is an outstanding student who works very hard. She is a cheerful, motivated, and dedicated student who tries to learn everything thoroughly. She has excellent analytical ability and communication skills. She is a good role model for other students. I am delighted to have her in my classes. I have known Beverly for two years. 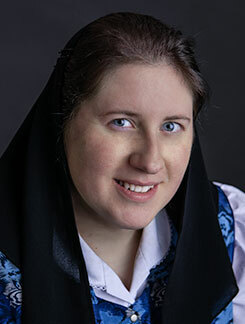 She is a Hutterite woman, happy in her life, balanced, smart and outspoken. She was a student in two of my courses the first year, and we continued to have discussions throughout the second year. She expressed the wish that people would, instead of looking at her, ask her about her life as a Hutterite. Since then we have had many conversation about a woman’s role in their religion. For every lecture hour she spend in my classes, she spent an equal time in my office, generally not because she needed any help but to discuss mathematics, university life, the Hutterite philosophy and her other courses. I have learned more from her than she has from me – her family history, life as a woman on a colony, the evolution and history of their movement and much more. My first contact with Beverly was in Calculus I in the fall of 2017. She was the most inquisitive student in that class and unhesitant in voicing questions. Having the best student, particularly a woman, with a combination of curiousity, interest and forthrightness in the classroom is invaluable to an instructor. You instantly understand that “if she doesn’t get it, then no one does”, allowing you to go back over the material or explain something in a different way. This is one of the most meaningful ways a student can contribute to a lecture, which Beverly did frequently and effectively. Furthermore her outspokenness encourages others to also speak up. Academically, Beverly was the only student in Calculus I that had a final exam grade of 100%, and she was again the top student in Calculus 2. She is an exceptional student, will be an excellent teacher, and I strongly support the first nomination of Beverly Walter for this year’s International Women’s Day event.